Department of Biochemistry, Kasturba Medical College, Manipal Academy of Higher Education, Mangaluru, Karnataka, INDIA. Background: Etoposide is an important chemotherapeutic agent that is used to treat a wide spectrum of human cancers. The efficacy of this drug is often limited due to severe sideeffects such as mucositis, anorexia, myelosupperssion, alopecia. At present there are no anti-mucositic agents without side effects. To combat these side effects of cancer treatment, innovative and specific nutritional interventions are needed. The experimental procedure included an oral treatment with combination of Spondias pinnata and whey preparation (100 mg/kg b.w).on etoposide induced mucositis. Methods: Study was conducted at Central Research Laboratory, Kasturba Medical College. Rats were sacrificed by cervical dislocation and duodenum collected for estimation of biochemical parameters. Estimation was carried out for assessing the levels of TAO, GSH, LPO, NO and activity of MPO. Correlation analysis was performed by one-way Anova using graph pad prism to find the relation between control and test. Result: The antioxidant (TAO and GSH) were found to be significantly high in the rats which received the combination compared to the individual Spondias pinnata and whey treated groups. Administration Spondias pinnata and whey in combination shows significant decrease in the TBARS, NO and MPO levels. Conclusion: Spondias pinnata and whey preparation supplementation in combination have shown mucoprotective effects in rat model. Hence it can be considered as anti-mucositis therapeutic agents which can be safely administered during chemotherapy and can reverse mucositis. Estimation of MPO activity in Rats. Vyshnavi GR, Nayak S, Shetty B. 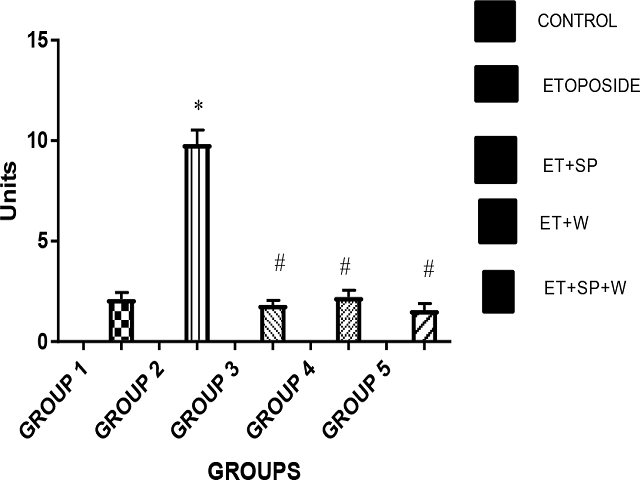 Evaluation of Modulatory Effect of Combination of Spondias Pinnata and Whey Preparation on Intestinal Antioxidants and Inflammatory Markers in Etoposide Induced Rat Model for Mucositis. Pharmacognosy Journal. 2018;10(4):640-644.